The literary journal, “Rattle,” is doing a special tribute to law enforcement in their summer issue 2012. Cops stick together, and cops who are poets are a rare breed indeed. The first week in January I received a letter from a sister poet cop who asked me to submit some of my work for this issue. I did. It wasn’t that easy, of course. Having just published A Little Lazarus, I had used a couple of my best cop poems. The submitted work needed to be previously unpublished, so I got busy and wrote something new. As if simply making a short deadline wasn’t challenge enough, I decided to write an essay. I’m working on writing creative non-fiction and this seemed the perfect opportunity to try my hand at a cop piece. Woe is me. I mean that in the best way. I’ve spent January writing and revising an essay that had a Feb. 1 deadline. I knew nothing about the issue until quite late in the day. Plus, I had a friend coming to visit the third week in January, so I had to make time to do both. Thank goodness my visitor, Jane, is a visual artist and was totally supportive of the two hours we spent on art every day, her sketching and painting while I wrote. These are the kind of friends you need. When you find them, treat them with great honor and respect. Feed them lots of good things and take them on adventures when you aren’t working on your art. You’ll want to keep them around for life. When an author or editor who knows you, or has heard of you through a mutual acquaintance, invites you personally to submit to their journal, you do it. Don’t ask questions. Do your research. Check out the publication if you aren’t familiar, read the submission guidelines, and get busy. Believe me, direct invitations to submit are rare. Writing about my policing years is tricky emotional territory. No doubt it’s really good for me, and all my friends, too. Instead of having to listen to my stories for the umpteenth time, I can simply send them a copy of the essay and they can read it (or not) at their leisure. War stories are like fishing tales and can get boring to all but the one telling the story, or other cops, veterans or fishermen. VFW’s and cop bars serve an important function in this regard. Normal people try not to bore others with this sort of thing, possibly because they have not been shot at or nearly killed in the everyday performance of their jobs. They will find some other way to bore us. But believe me, weird things happen to everyone and I think folks should write about their weirdnesses. It’s great exercise for our memories. It was easy to write when I began because I love a blank page and a first draft. But, those revisions were killer. I have one of the world’s toughest editors. My partner’s editorial nickname is “Cut-Cut.” She will literally slice your essay to ribbons. It will be a thousand words shorter when she hands it back. Whole paragraphs will have changed places. Some will simply have ceased to exist. She tells me these are simply suggestions, but they are strong suggestions. The hard part is that she is almost always right. That leaves a ton more work to do. She’s the best editor I know for long work. I use a lot of words. After years of practice, we have learned to do this without divorcing. She is heartless and knows that I will curse and stomp around and argue, then consider her edits, and cut away. I need someone like her to review my work. I love words, lots of words. She would cut these blogs to pieces, but I consider this sacred space and don’t ask her to edit. Perhaps you are thinking I should. Forget it. My first word was “mine” and I have to have some place where I can do exactly as I please. I’m grateful to Leigh for the time and effort she puts into editing my work. She is the best. She loves structure, order, putting together puzzles. I am the chaos kid. So, as you can see, you need at least two (more if you can get them–like my writing group) readers and they should be different. One should be your “believing mirror,” like Jane (see Julia Cameron for more on this topic). The other should be your toughest critic, who also is willing to let you do what you want with the raggedy little pieces she hands back to you. Between Leigh, Jane and my Hens’ Teeth, I am a lucky writer to have so many great readers. The main gist of my post today, although I have strayed, is to get the work out there once you’ve been invited to do so. However you do it, with or without help, an invitation to submit is a message from the universe. Someone likes your work enough to ask for it. Please accommodate them. You won’t be sorry and neither will they. Allow your sense of accomplishment to come after you made the deadline. Don’t wait to celebrate until you know if they are accepting it. You did your part and writing, after all, is the most important part of what you do. When I travel and when I write, I notice that little miracles tend to occur along the way. That longed-for phrase finally pops into my head to fit the sentence perfectly. The metaphor I’ve been chasing like a loose rooster suddenly stops so I can swoop it up and put it in the pot to stew. When I travel, invariably someone, often a stranger, performs an act so kind that I can barely believe it. I can only hope that I am that person for someone else once in awhile. These things I call “little miracles.” They happen all the time; everyday, I’m sure. But we have to be paying attention in order to catch them before they fly past. And (this is the hard part) we have to show a little faith in the basic goodness of life (even in these “mortal coils” we call our fellow beings) in order to catch the miracles at work. Leigh and I were five hours into our Atlanta vacation where we were headed to hear our favorite band, Roxie Watson, play when the first “little miracle” occurred. We got away from Fayetteville later than we intended (of course), so by the time we reached Russellville, AR we were already hungry. 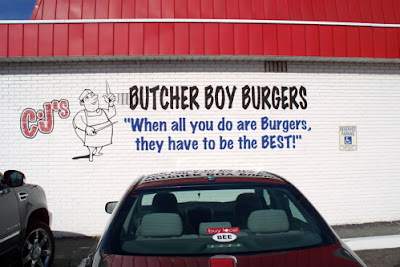 Well, I happen to know that the best hamburgers in Arkansas happen to be in Russellville, so we pulled off at exit 81, and turned into CJ’s Butcher Boy Burgers. Now, I’m not kidding about these burgers, y’all. (This post may not be as appetizing to you vegetarians, but it’s still worth reading.) The beef is ground and weighed into 1/3 lb size balls, then hand-flattened into patties and grilled in the best old fashioned way. The hamburger, onions, tomatoes, lettuce and potatoes for french fries are visible right there in the front case. The menu is small: Hamburgers or cheeseburgers, french fries, sodas, and 3 kinds of milk shake–chocolate, strawberry, vanilla. To me, a small menu can only mean one thing; they make the best whatever it is they are advertising. Anyway, Leigh had never eaten there and we loved our first road repast. We knew that every place we stopped would not be nearly as good, so we ate heartily. Then we headed out, changing drivers in the parking lot, and took off towards Memphis. 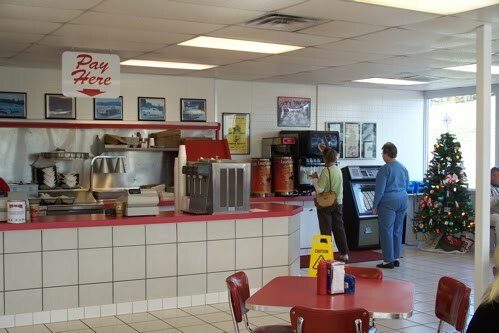 We had been cheered by the decorations of the old-fashioned hamburger joint with its red booths, juke box, and shiny chrome fixtures. The staff was friendly and efficient even though they were busy, as always. I made Leigh wait while I took a few pictures to document our first cool oasis on a long, dry interstate. On the other side of Memphis, we stopped for gas and drinks. I reached in my comfortable traveling sweatpants pocket to pay, only to find that my favorite money clip–a gift from two of my best friends–was missing, along with the $90 in cash it clasped. You know that sickening, sinking feeling where the hearts seems to drop down into the belly like you swallowed it accidentally? That’s the feeling I had. More than the ninety bucks (hard enough to come by in this economy), I’d lost one of my most prized possessions, the mother of pearl money clip given to me as a birthday present from Lenny and Jane. Very unhappy moment. I tried to recall, as we do, every place we had stopped. I stop a lot, so this took a minute. Besides CJ’s, we had stopped at a gas station and a rest area bathroom. Part of me wanted to give up; to just say okay, these things happen. I could tell Leigh agreed, although she said nothing except to express her sorrow at my loss. But that money clip kept calling my name, and there was something about CJ’s, too. If I lost the money there, then somehow, some way, they might still have the clip for me. It was worth a try. I called information and got CJ’s number. Meanwhile, I was not acting like the sweet traveling companion that Leigh had started out with. I felt sick at heart over this (when you think about the state of the world) small loss, but luckily my companion is a hospice nurse and understands loss, both large and small. I could tell she thought my call would most likely be futile, but she said nothing as I made it. Lisa says to me, “Can you describe the clip?” I wonder how many other people left $90 in a money clip there that day, but you never know. Sure enough, seven days later, we were back at CJ’s and Lisa, the manager, washed her hands from the burger she was mixing, and retrieved my money clip and money. Most of our trip was delightful in every way. Of course, there are always a few bumps in the road. But this incident stands out in my mind as one of the finest memories I brought back with me. Something so unexpected; something as beautiful as the true meaning of Christmas started out to be. Something about hope and faith and like I said, miracles. In the great scheme of things, this tale may be small to everyone but me. Getting that money clip, and even the cash back, felt like a big deal. It deepened something like faith in me, when it’s so easy to give up on humanity these days. I mean, we rarely hear the good stories, right? That’s one reason I’m writing this one. And so you won’t miss the best hamburger in Arkansas when you whizz by Russellville. Make sure you stop at CJ’s, exit 81. And be sure to say “Hey!” to Lisa for me. Oct 7, 2010 - How-To, Writer's Life Comments Off on Buy your copy of A Little Lazarus with free shipping here! Buy your copy of A Little Lazarus with free shipping here!